Do you like to save money? I don't know anyone who doesn't. Below I am going to list the best coupon apps and sites. With most of the apps and sites below you can save even more in addition to coupons! Plus some offer bonuses just for joining and using there app or site to save money. Oh and one more thing some offer bonuses just for telling your friends. So in addition to saving money, you can also make money! It doesn't get any better than that!! Ibotta is the number 1 app couponing app. If you do not have this app you are missing out on tons of savings. You can earn cash back for purchases in grocery or retail stores in addition to the coupons you already use. Plus, when you join earn a $10 bonus using ibotta referral code fyjmta. Be sure to do at least one rebate in the first two weeks to get the $10 bonus. Ibotta also offers tons of other bonuses on top of the cashback from purchases. Click here to join! Ebates is great site that offers cashback for 1,000's of retail stores. Ebates offers a different percentage for each store. For example Walmart is 1% cashback, Macy's 6% cashback, Ebay up to 5% cashback, etc... Just like ibotta you will save in addition to coupons! Plus ebates will also give you a $10 bonus when you join. Click here to join! 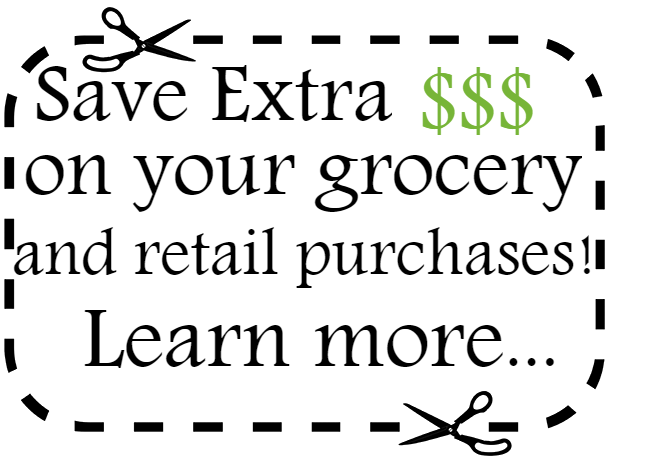 SavingStar is another great way to save on grocery purchases in addition to using the ibotta app above. SavingStar and ibotta may offer cashback on the same products, so you can save double or triple if you used coupons. You may even end up getting some groceries free!! Yay!! I love free!!! Click here to sign up! MrEbates is just like ebates only they offer different rebates and sometimes may have a store that ebates does not. I usually check both sites to see which one I can earn more cashback on for a particular store. Just like ebates they will have available coupons to use in addition to the cashback you will receive after purchase. Mr.Rebates also offers a sign up bonus which is $5. Click here to sign up! Swagbucks is another site to earn cashback, but works a little differently. With Swagbucks you earn points which can be exchanged for cash. Another good thing about Swagpoints is you can earn points for printing out and using coupons. Which makes for even more savings on your groceries in addition to all the cashback you will be earning between the apps! Click here to sign up! Checkpoints is somewhat different than the rest but a way to earn extra cash just for shopping. With the checkpoints app you can earn points which can be exchanged for cash or gift cards by scanning items in the stores. Click here to check it out and enter Checkpoints referral code dana2100 for bonus!